“Currently it’s 16° and raining,” announced the pilot as the twin-engine propeller aircraft buzzed north like a happy bumblebee to the Isle of Man. Having left London on one of the hottest days of the year it was almost good news, and the rain soon stopped. “Hello Mike,” said Allan Davies, the friendly owner of ASP Car Hire, as we entered Ronaldsway’s arrivals area. In answer to my query he said he recognised me from the photo on my driving licence. Worryingly it’s the same photo on my passport and, as they say, if you look like your passport photo you’re probably too ill to travel. Heading back south we arrived at The Curraghs Wildlife Park and its unusual collection of animals and birds. 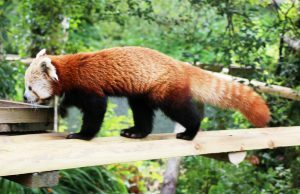 A red panda paraded like a catwalk model, ignoring visitors who were trying to photograph him. Lemurs, spider monkeys, otters, raccoons and more played in large enclosures, while peacocks, maras and others mixed with visitors in open areas. A keeper threw fish, expertly caught in the huge bills of pelicans, while a nearby flock of flamingos used their upturned bills to collect food from the lake. 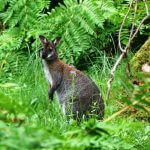 Later we met John ‘Dog’ Callister, a carpenter by profession and volunteer wildlife guide who took us on a fascinating walk through the woods of the Curraghs were we saw one of the many wallabies that, some years ago, escaped from the Wildlife Park and now breed happily in the wild. We looked at each other for a few minutes before he bounced off, like a space hopper, to tell his friends about the strange two-legged creatures he met in the woods. It was an entrancing two hours spent in the company of a very knowledgeable nature enthusiast. That evening we enjoyed a great meal served by the excellent young staff at Jean-Pierre’s Bistro in Ramsey before heading to our hotel in Douglas. 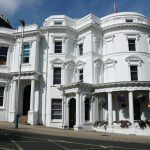 Our base was the elegant Regency Hotel with stunning views of the promenade and Douglas’ two-mile sweeping bay, and we were ready for our comfortable bed. Next morning we took the lazy option and drove into the centre of Douglas to explore the harbour and the heritage railway station. We also visited the Tynwald, the island’s parliament, the world’s oldest with over 1,000 years of continuous use. Then we headed west to Peel, whose castle dates back to the 10th century; it’s still used for weddings. Peel is also famous for its kippers (just follow your nose) and the tiny single-seat P50 car which, in 2014, celebrated 50 years of manufacture. 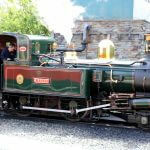 At Douglas’s railway station visitors can board the heritage steam train that runs south to bustling Port Erin. Dating back to 1874 the service still uses the original engines and rolling stock and has starred in a Thomas the Tank Engine movie. 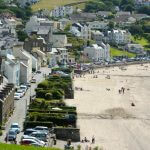 Port Erin’s large, gently curving bay is popular with locals and tourists alike. 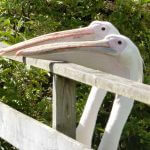 Nearby Port St Mary has a smaller but equally delightful bay, a peaceful resort to chill out. 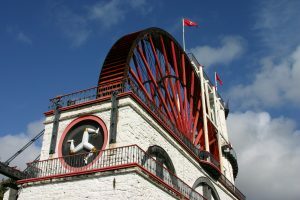 Island fact: Laxey is famous for having the world’s largest working water wheel, built in 1854 to pump water out of the mining complex. An impressive 72ft (22m) in diameter, it was named Lady Isabella after the wife of the island’s then Lieutenant Governor Charles Hope. 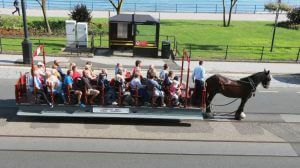 Visitors also love Douglas’ horse-drawn trams. 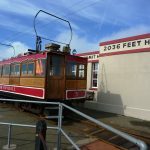 The service started in 1876 and runs along the bay’s two mile promenade, linking the electric train terminal to the ferry terminal in the town centre. Pulled by strong Shire-type horses, they clip-clop their way along the road, to the delight of passengers and onlookers alike. These unique and varied modes of transport are a convenient way to see many of the island’s attractions as well as being major attractions in their own right. The convenient ‘Go Explore’ card, valid for one, three, five or seven days, allows visitors use of all bus and heritage transport services. Everywhere you go you are reminded that the island cares for its animals. There are many facilities for local pets, and a rest-home for retired horses. Visitors can see these friendly animals, and 30p buys a small bucket of food to give to the horses. 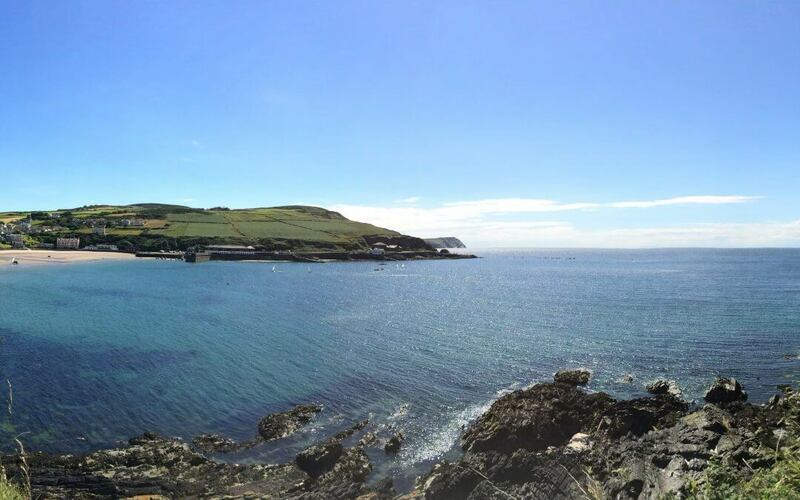 There are daily flights from a number of regional airports as well as ferry services from England and Ireland.